Along with beautiful bright color, sauteed radishes also have delicious flavor making them a perfect fall/winter vegetable. I’m not sure enough people have given radishes a fair shot. Have you tried them cooked before? I have memories of eating them raw as a kid and thinking they were terrible. Although they make a salad pretty, I couldn’t understand why anyone would eat them! It wasn’t until recently that my daughter spotted them in the grocery store and wanted to try them. I reluctantly purchased them, with a smile of course. This recipe pairs them with fresh orange, garlic and rosemary creating a caramelized balance of flavor with a little hint of sweet. 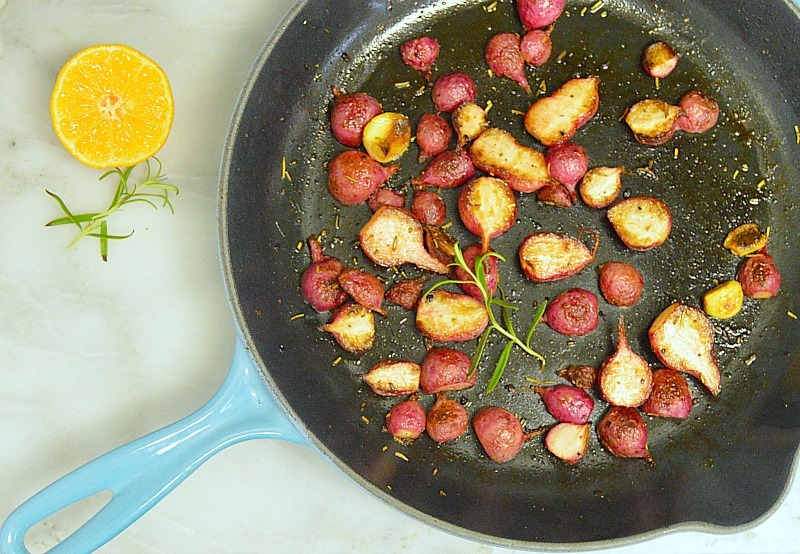 If you haven’t tried radishes before, try this recipe..they may surprise you! It wasn’t until recently that my daughter spotted them in the grocery store and wanted to try them. I reluctantly purchased them. I tried to cook them with seasonings to see if they could taste decent. Surprisingly, they were really good, almost like a sauteed potato. This recipe pairs them with fresh orange, garlic and rosemary creating a caramelized balance of flavor with a little hint of sweet. If you haven’t tried radishes before, try this recipe..they may surprise you! In a small bowl add fresh squeezed orange juice, rosemary and half of the salt and mix well, set aside. In a large saucepan drizzle olive oil and turn heat to medium. Place garlic in pan and let heat. Slice radishes in half lengthwise and add to pan with garlic. Cook on medium for about 5 minutes to caramelize. Pour orange mixture over radishes and stir. After about 5 minutes, reduce heat to medium low and let simmer for about 10 more minutes stirring occasionally. Add rest of salt, dash of pepper and more rosemary if desired. Let simmer until they are tender and are pierced with a fork easily. The cloves of garlic give a hint of flavor, if you do not like roasted garlic itself leave in pan and serve without. 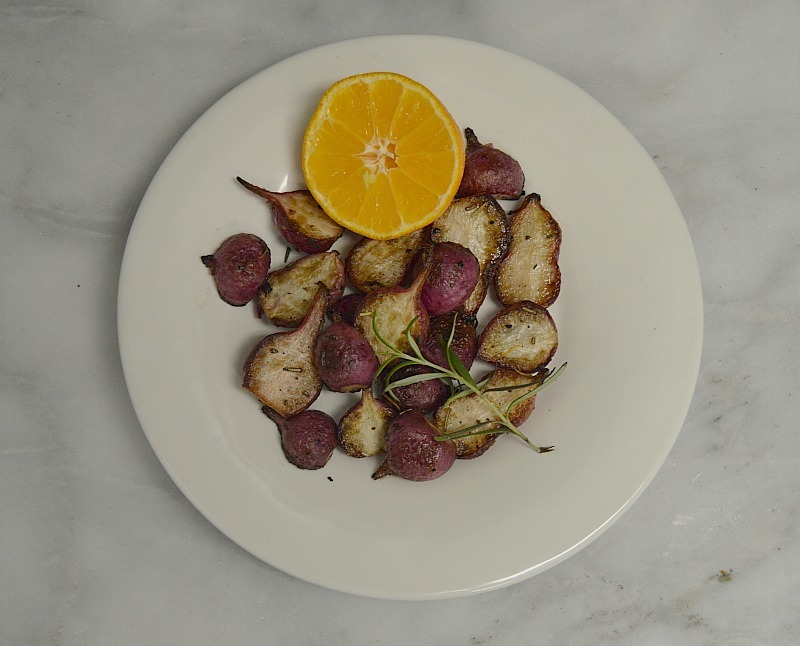 I serve this side with a sprig of rosemary and a slice of orange to add more flavor. I found that a cast iron skillet worked well for this recipe.